We have a range of Shure Microphones available to hire. Prices start from $11 per Day for one Shure microphone with boom-stand and lead included. Additional days are at a discounted rate. 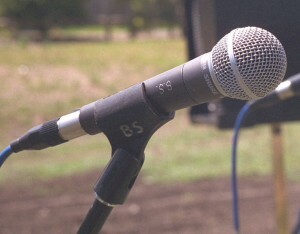 The Shure SM58 is probably the most well known vocal mic in the world. If you are a singer and don’t own one of these yet then perhaps you should try before you buy and rent one from us. Another popular choice for vocalists is the Shure Beta58A. This mic has a super-cardiod pick up pattern making it more directional with better feedback rejection. It also has a more pronounced presence peak and this makes it cut-through more effectively if you are in a Rock band with extreme volume levels on stage.